This site is packed full of DIY projects and instructional videos on topics like solar power, boondocking, batteries, general RV maintenance and much more. I believe you can gain the confidenence to work on your RV like I have. Most of the materials and tools I use for my RV projects I purchase from Amazon. I try to put together a parts list for each project so you can find parts quickly without searching around. Here are some of our popular parts lists. In my early teen years I had a friend who lived with his family on a 34 foot sailboat in Waikiki. After school I would go down to the marina and hang out with he and his family. At the time I thought "how cool is this that you could have the freedom to move around from place to place and explore new places while never leaving the comfort of your home." I would later learn how to sail and thought that one day I would live in a sailboat of my own. Now more than 30 years later, family and career have taken priority over my adolescent dreams of living on a boat. I now live in the beautiful Pacific Northwest and no longer have dreams of living on a sailboat. Nevertheless, the appeal of a life of independence, self-sufficiency and adventure still exists for me -- if not on water, then on the open road. Melissa's dreams of RVing started as a young girl. That figures, because she is a second generation wander luster. Growing up in Southern California desert, her family traveled up and down the coast each year to visit family in the Pacific Northwest. During those family road trips, Melissa dreamed of one day being able to sit at a table or lay in a bunk while watching the world go by. Melissa's parents are now avid RVers and often RV with us. 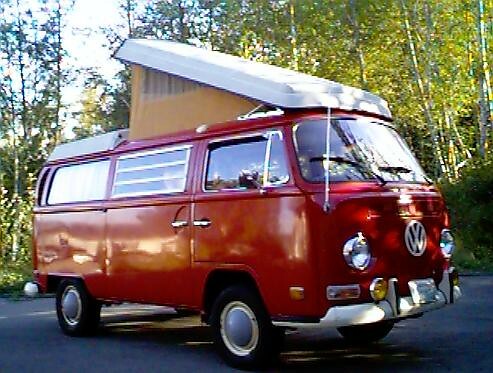 Back in 1987 I purchased this 1970 VW Camper from the original owner. I had previously owned a Dodge conversion van in Florida in the early 80s and would frequently spend many a weekend at Daytona Beach with friends. Upon returning to the Puget Sound area I wanted a sleep-in vehicle that got better mileage than my gas-guzzling Dodge Van. The VW Camper would prove to be perfect for me. For 11 years, the VW camper would be my primary vehicle. My wife and kids would share many memories with me in the VW. Ironically, during those years, the thought of a motorhome never even entered my mind. After all, it was mostly older retired folks who had RVs. We sold the VW in 2000 to a couple who flew up to Seattle from San Francisco to pick it up. It seemed like my camping days were over. In the years to follow, annual family vacations would usually consist of a flight to some warm location for a week in the sun. Little did I know that things would soon change. The RV lifestyle was just around the corner. In 2007, we began spending time with friends and family in their RVs. Weekend road trips, wine tours, and family vacations in an RV started to appeal to us. But if we were to continue, we would have to have our own space. After months of extensive research and RV shopping we finally took the plunge in November 2007 and officially joined the ranks of satisfied RV owners across the country. I can't tell you how satisfied we have been with our RV. My dreams of independence, self-sufficiency and adventure are being realized, not on the sea, but on the open road in our RV. In our first two years we logged more than 15,000 miles on the open road and have seen more country than ever before. We manage to do this despite busy work schedules, school and rising gas prices. Looking back over the last 30 years, it seems like it was meant to be. On our travels I've seen a growing number of RV couples and their kids on the road. In Hill City, South Dakota I met a family camped next to us who had driven from Florida to visit Mt. Rushmore. So there we were, a family from Washington camped next to a family from Florida. How cool is that! They were renting an RV to haul their 3 kids around the country. I spoke to the dad who was asking lots of questions about our rig because they too were considering an RV of their own. I told him that it was perhaps the best thing we've done for our family. It's certainly been a dream come true for my wife and I. I enjoy sharing my enthusiasm with other families considering the RV lifestyle. While in the military I visited several countries around the world and have concluded that there is no better place to live than right here in the USA. So let's enjoy it and get on get out on the road to see more of it. Leave us a comment or just say Hi!